Apple's battery secrets unveiled: does it compare to Android? It took only 12 versions of iOS but, finally, the Apple operating system has complete and detailed statistics about the battery consumption of its products. Thanks to these statistics it will finally be possible to confirm or dispel the myth regarding the terrible or fantastic (depending on who you ask) battery life of the iPhone! The battery statistics for iOS have always been quite limited and not perfectly clear if I'm honest. The information reported up to iOS 11 related to the battery consumption of the various apps expressed as a percentage of the battery charge consumed. It was difficult to understand at first glance. What has always been missing to be able to compare iOS devices with the Android counterpart is the time of active use with the display on because iOS has always only indicated the "Use", which omitted more granular information such as power consumption with the screen on and off (or for example listening to music) making the value not really comparable with Android. Those days are over! In iOS 12 you can not only see a graph of the remaining battery charge during the period of discharge and recharging but there is a very detailed bar graph with data about the use of your smartphone with the screen on and off. There is also a section including statistics for the last 10 days and the average usage time with the screen on or off. Thanks, Apple! Along with these two important data points, there is also the level of the last charge that indicates the time when the device in question was disconnected from the charger and the percentage of charge at that exact moment. This way you can exercise better control over power consumption with an overall improvement in battery performance. Of course, it's really nice to see this new information exposed to sunlight and this will certainly help comparisons between iPhone, iPad and other devices in terms of battery life. Apple still has to file some small details, though all this is forgivable as it is the first time that these charts are inserted into the system. For example, daily battery statistics include the last 24 hours and not just the time that has elapsed since the smartphone was disconnected from the charger, which can be misleading. Thanks to the new functions concerning digital well-being, however, we can complete the information in our possession. By accessing the menu called Screen Time, we can go into even more detail by checking the number of notifications received per app, the number of times we have unlocked the smartphone and the time I use you for each app. In this case, the statistics start at midnight and therefore show a more realistic count of hours of active screen than the battery menu, statistics that will make little sense if you use your smartphone even at night going to rest after 00:00. Hey, all in all it's a start and it's promising! Good or bad news for iPhone? It's too early to say. Lately, I'm using my iPhone X less and less as a result of being distracted by other smartphones that I find more interesting, so it is difficult to give you even approximate statistics. In my place there are those who had the opportunity to notice these statistics and talk about it (even if briefly) in a video. Marques Brownlee, a famous YouTuber also known as MKBHD, recently published a review of the iPhone XS indicating an average usage time of about 4-5 hours. This figure will make Android users smile that with some smartphones can safely exceed that figure and not by little. Personally, the time of use is around the numbers that with my personal use I get with virtually any Android that I've had the opportunity to try (now more, now less), I can not wait to test my iPhone and new models coming soon. Which flagship do you prefer? 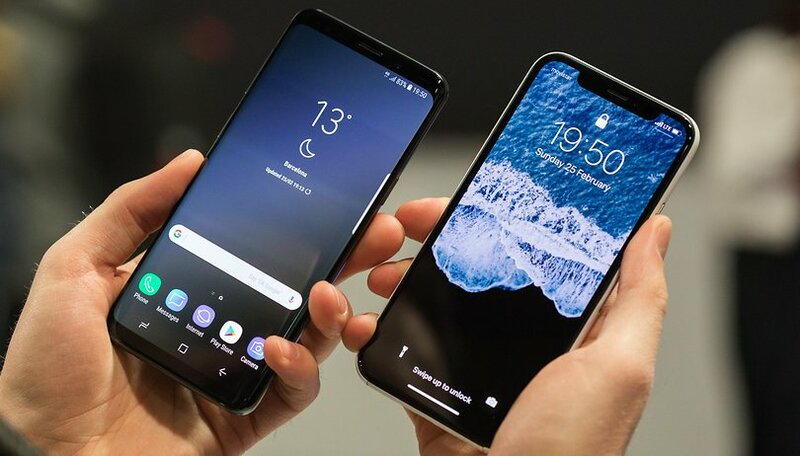 Choose “iPhone Xs” or “Galaxy s9+”. What do you think? Are you curious to find out how much actual use you can get out of an iPhone? This is interesting since there are those of us that may care since we're not tied to Android or iOS but only want to have what works best for us. Right now for me it's the Pixel 2. But I'm always open to consider my needs versus what I can get to fulfill them. It's the bang for the buck theory. Until I purchased the Essential, when they had the fire sale, my last three phones, had 4,000mAH batteries. I was a little concerned the battery in the essential having only a 3000 ma battery, with a brighter display, faster processor wouldn't make it, but at the end of the day, typically I have 40-60% left. Who cares when the iCrap battery capacity is only little over 3,000mAh? What? The capacity is smaller than the last year's iPhone X?!?!? Boy are iCrap-sters really retarded. In the Android world, so many have 4000mAh batteries already! Especially the leading Chinese innovators like Huawei/Xiaomi. Even the similarly overpriced Note 9! apple squeezes out a lot more battery life from a smaller battery than android can even dream of, especially in standby time. my one beef with android. Why do I care about iphone battery stats? Do we routinely carry iPhones here? Still seems apple can't supply the juice. Not really anything to do with the article, but I dont like the new vote setup. Ilike the idea, look, but something to let me know my vote was registered would be nice.